i have never seen a thread of just SPID pitures. I thought it would be neat to start one, just becasue i like seeing all the diffrent combination of options these trucks came with. i'll have to get a couple pictures of the ones i have. This is the one ton onghorn's SPID. Sad part is... only about 8 of those options are still there. 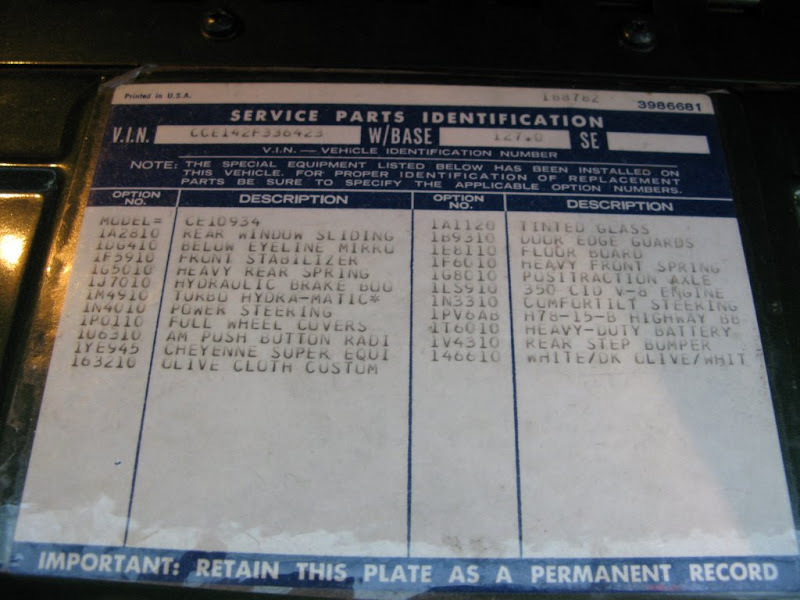 The 72 burb... only a few of these options are missing. KNOXVILLE TN. LYNN CAMP SPEED SHOP TRUCK ! 1968 C10 with all kinds of patina ! THE KIDS TRUCK ! I know I have more... but this is all I can find. Last edited by Longhorn Man; 03-08-2008 at 02:04 AM. I`m glad you started the thread.Maybe I can start getting a collection back on my`puter after losing them all.Right click,save picture as...VIN-specs . that second to last one sure is loaded! am/fm, tach, buckets, tilt, and tons of sother stuff... was that a longhorn? Hey Longhorn man thanks for the push , I was about to show mine. 2008 Buick Enclave AWD, Nav, & DVD, Wife LOVES it! Last edited by Longhorn Man; 03-08-2008 at 03:41 AM. Last edited by CG; 03-08-2008 at 04:42 AM. Last edited by 70cst; 11-02-2010 at 07:22 PM. Here's the one in my truck. Longhorn Man never seen such a no frills option as that one its blue with blue trim thats all. Kind of cool that one that stripped is still around. 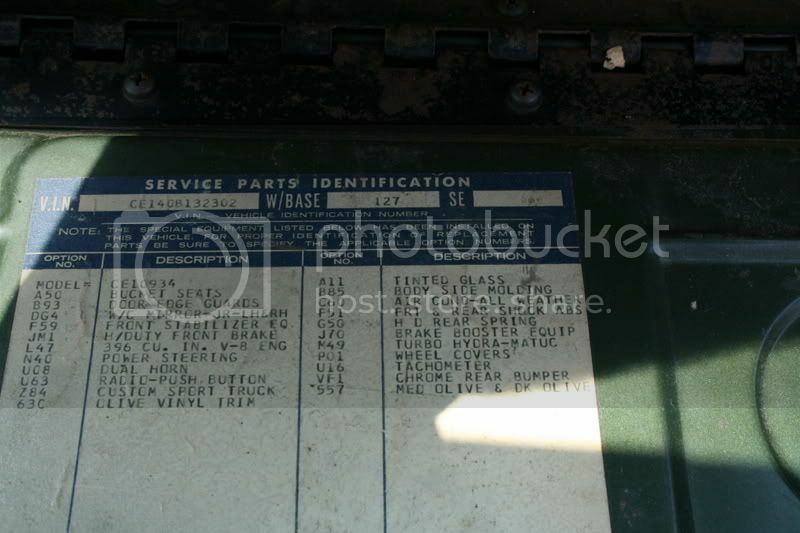 i guess it couldnt have been, i looked at it again and it was a gmc K2500, and it looks like a 71-72 based on the amount of =options, and the option codes, not havein gthe extra didgits in them. you can't go by the extra digits part... if you look at my 70 longhorn, it has short codes, and my 72 burb has long code. why is that? did it depend on which factory it came from or somthing? 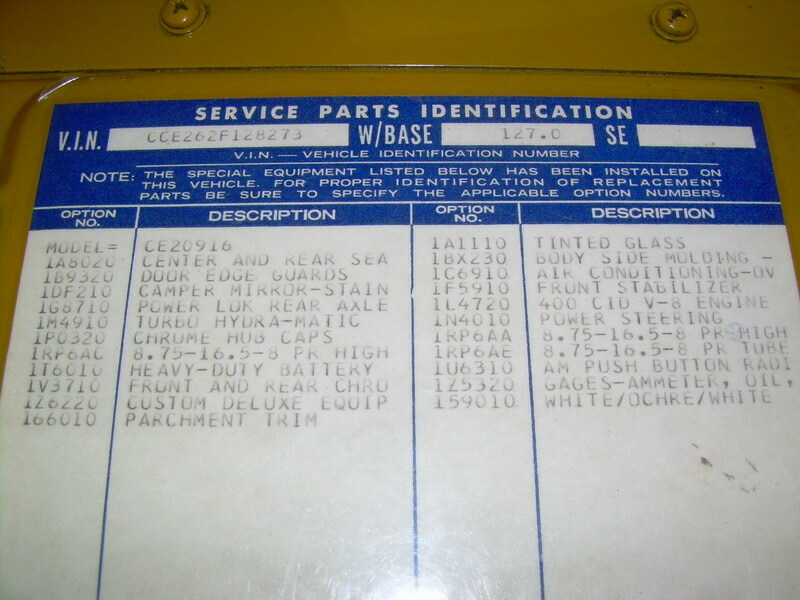 all the 71-71 trucks ive ever seen had the short codes, so i just figured thats how it was. I think it depended on who was typing that shift/day of the week. my old longhorn was a 70... just like this one, and it had long code, same with the GMC I had. But interestingly... looking over this small assortment of SPIDs... all the ones built in St Louis have long code.